Giorgio Chiellini is not known as a scorer in the football world. The 6' 1" Italian central defender has amounted just 26 goals from his defensive position in over 300 matches with his three Italian clubs, and just four goals for his national team in 71 matches; before yesterday that is. On October 10th, 2014 Chiellini was very much the center of attention in his side 2016 Euro qualifying match against Azerbaijan. Although the hat-trick was not quite as glamorous as it may sound, Chiellini was the only scorer on the night at the Stadio Renzo Barbera in Palermo. For a man who had never scored more than 5 goals in a whole season, 3 goals in any kind of capacity is an incredible achievement. Whether or not he will celebrate October 10th as a highlight of his career is yet to be seen, but the fact that this day will stay with him for the rest of his life is assured. Azerbaijan was never going to be a real threat for Italy's chances for a home win, and Chiellini proved it to be correct just before half-time when he got on the end of a corner-kick and slotted the first of his three on the night in the 44th minute. The visitors could not manage to create real scoring chances against the much stronger Italian, but in the 76th minute Chiellini was on the board again, only this time cancelling out his earlier goal as he stumbled onto yet another corner-kick to put the ball in the back of his own net to equal the score at 1-1. Giorgio went from Italian hero to an unlikely Azerbaijani savior in a span of 22 minutes. But just six minutes after that, the grand finale of Chiellini's three goal night would be on display. With the Italians pressing for a winning goal, the big man was now in the Azerbaijani box waiting for a ball to be delivered in. Sebastian Giovinco's ball was right on the money as Chiellini headed it into the back of the Azerbaijani net to give his side the 2-1 final win. 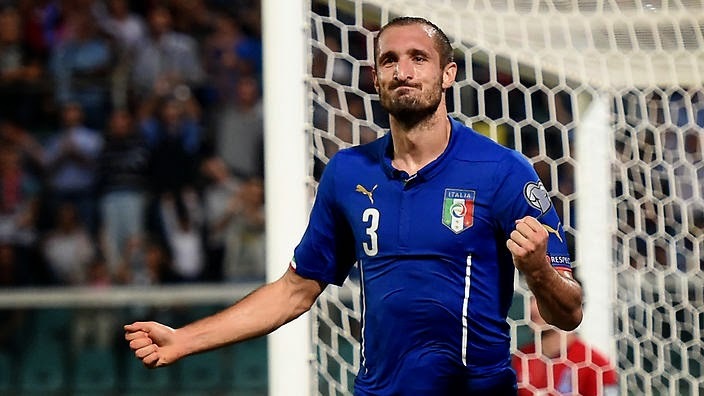 Of course the own-goal will not add to Giorgio Chiellini's tally of career goals scored. Nonetheless, the defender was all the talk on the night, having scored every goal in Italy's meeting with Azerbaijan; a night the Azzurri faithful will likely remember for some time.